Debbie Tougas is a professional artist and an active member of the Federation of Canadian Artists. Her passion for painting and her use of texture through the exploration of various acrylic mediums make her a natural at abstraction. The unique quality to Debbie's work is felt through her creative use of vibrant color with her ultimate goal being expression in a contemporary and abstract form. Debbie lives in Penticton, B.C. and has a studio at the Leir House Cultural Centre. She has recently retired from her Marketing Manager position of 19 years to dedicate her full attention to painting and her Retail Merchandising and Visual Presentation business. While her background includes working in marketing display and retail management, her career path began when she graduated from Penticton Secondary School with an Art Scholarship. Debbie completed her Fine Art Diploma from OUC in Kelowna, this lead to her graphic design program at Emily Carr College of Art in Vancouver. She then completed her education with an Art and Merchandising Diploma from Langara College in Vancouver. Debbie has displayed her paintings at NK’MP Cellars, Sumac Ridge Winery, the Wine Experience Centre, Bliss Bakery, the State of the Art Gallery in Kelowna, Kelowna Rotary Centre of the Arts, The Penticton Art Gallery, The Shatford Centre Okanagan School of the Arts, The Leir House, Gallery 97, and The Art Walk in Lake Country. Most recently Debbie was selected as the Artist in residence in Vancouver at the Four Seasons hotel. 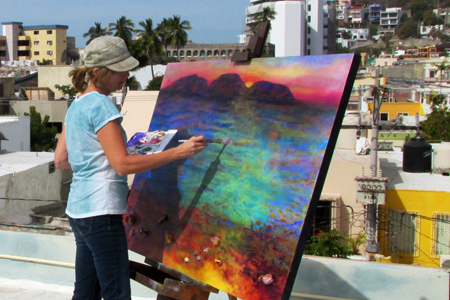 You will find Debbie painting in her studio most weekdays in the summer. Call her to see the latest paintings at her studio located in the Leir House.